INDCs emerged in Warsaw at the end of 2013, when negotiators agreed to abandon the quixotic quest for a one-size-fits-all, top-down agreement like the failed Kyoto Protocol and aim instead for a global framework within which countries can embed their INDCs – leading, in theory, to a “race to the top” that will keep global temperatures from rising more than 2°C. The process accelerated in Lima at the end of 2014, where negotiators agreed on a sort of laundry list of what constitutes an INDC. It progressed further in Geneva and the former German capital of Bonn – where negotiators finally agreed on detailed rules for using carbon finance to slow climate change by saving endangered rainforests. Climate negotiators arrived in Bonn to a stripped-down text that ignores contentious issues that had been holding up talks for years – issues that are sacred to some but profane to others, and that they’d never all agree on, anyway. That’s what makes the Paris Patchwork different from the Copenhagen Accord, the Bali Roadmap, or the Kyoto Protocol. 19 October 2015 | Schenectady NY is home to a little shop called Quiltbug, which sells patches and threads and patterns for making quilts. 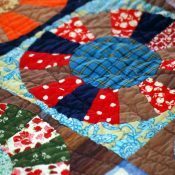 It has a web site with a glossary on it, and the glossary defines a “charm quilt” as a “quilt made of many small pieces of fabric where each piece is a different fabric”. This year’s climate talks are something like that, because – unlike years past – negotiators aren’t charged with the impossible task of weaving millions of incompatible threads into one uniform sheet, but instead with the merely herculean task of piecing together more than one hundred patches, called “Intended Nationally-Determined Contributions” (INDCs), into something that might be clunky and inelegant, but that should prevent our planet from warming more than 2°C (and preferably 1.5°C) over the next century, because that’s the threshold beyond which things get hairy. Countries have been rolling out their INDCs all year, and the United Nations will publish an official “synthesis” of all the INDCs before the end of next week to let us know how close we are to the 2°C target. The Climate Action Tracker (CAT) took a stab at it earlier this month, and estimates that plans currently on the table will limit the increase to 2.7°C. That’s down from 3.6°C in earlier projections, but still not deep enough to avert disaster. To meet the 2°C target, INDCs will have to be beefed up dramatically, and also be made to fit together snugly. You can find them all here, and they’re a motley mix, indeed: some of them actually fit together like yin and yang, while others clash tragically – in part because different countries have different views on financing flows and market mechanisms. Negotiators meeting in Bonn this week are supposed to be putting together something like a paper pattern that will show us how the pieces fit together, and that in part means figuring out which elements of climate strategy should be left to INDCs and which should be universally defined. Towards that end, they jettisoned the usual, detailed compendium of solutions and began with a stripped-down, 20-page “informal” rough draft of the negotiating text that leaves out scores of phrases and mechanisms that some countries hold sacred and others hold profane. The eliminated mechanisms all have one thing in common: there is no way every country on the planet would agree to them, and the hope is that they can be relegated to INDCs rather than included in the framework agreement. Forests Look Set To Play Big Role In Paris Patchwork Climate Accord, which is our Friday wrap and includes interviews with observers from The Nature Conservancy and the World Resources Institute. Take, for example, the text’s treatment of REDD+, which is a cluster of mechanisms designed to slow climate change by saving endangered forests and Reducing Emissions from Deforestation and Degradation – plus activities like climate-safe agriculture and sustainable forest management. It’s critical to slowing climate change because forestry and agriculture together account for about 30% of all greenhouse gas emissions, and negotiators from all countries unanimously agree that REDD+ should be a pillar of this year’s climate agreement. In June, they even signed off on all the rules and guidelines around REDD+ except one, yet REDD+ was nowhere to be found in the new rough draft. That’s because the one component they didn’t agree on is one they probably never will agreed on – namely, whether market mechanisms, such as offsetting, can be used to fund REDD+. The question now in Bonn is whether the agreements to date provide enough clarity on REDD+ to let individual countries work out the financing through their INDCs, or whether the overall agreement needs specific guidance in that regard. It’s a massive question, because an Ecosystem Marketplace analysis of INDCs shows that at least 56 developing countries have made their own emission-reduction targets contingent on the amount of financial help they get, and that amount is often contingent on how REDD+ is recognized. That research will be out next week, when we release this year’s State of Forest Carbon Finance Report, which will be released next week, but the current numbers show that 53 developing-country INDCs are offering two sets of targets: one that they would aim for without international support, and more ambitious ones they would aim for with international support. The final three – the Dominican Republic, Equatorial Guinea, and Madagascar – said that their entire climate commitment depends on international finance. What’s more, a staggering 29 developing countries explicitly said they plan to implement a national REDD framework or sell REDD offsets, which means they match up nicely with developed countries like Canada, Liechtenstein, Monaco, New Zealand, South Korea, and Switzerland – each of which specified that they might use international offsets to meet their INDC. But they clash with a few developing countries – most notably Brazil, which believes that international REDD+ finance should be performance-based, but not offset-based – meaning that foreign governments can fund REDD initiatives within Brazil, but they cannot use emission-reductions achieved to offset their own emissions. It’s a policy that will clearly clash with any effort to define REDD+ as a market-based mechanism. The Coalition for Rainforest Nations has led a charge for explicit inclusion of REDD+, and today they submitted explicit definitions it would like to see in the framework agreement, but many environmental NGOs that had previously advocated for such language aren’t pushing the agenda this year. Josefina Braña-Varela, who is in charge of policy for WWF International’s Global Forest & Climate Programme, said she’d also prefer a more explicit reference to REDD+, but that the current text was probably good enough. Gustavo A. Silva-Chávez, who runs the finance-tracking initiative REDDX for Ecosystem Marketplace publisher Forest Trends, said he’d also like to see REDD+ more explicitly mentioned, but added that, as long as market mechanisms aren’t explicitly banned, then countries can proceed as they see fit. “I think we’re good for now, unless one of the countries inserts language that explicitly forbids market mechanisms,” he said.